The Facebook page tracking software “tobetracker” allows you to get detailed information about Facebook pages of interest. The presented data gives you insight information about the number of fans and the development of this number regarding brands, companies, organizations and public persons. This information can be very helpful while doing a competitor or market analysis. 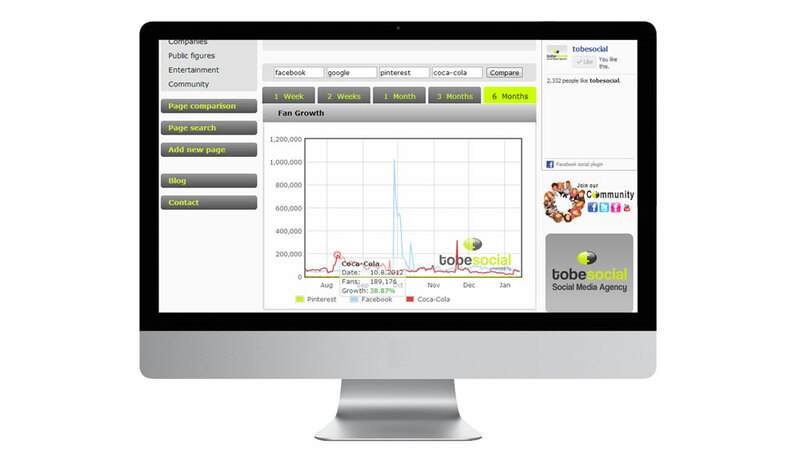 On the basis of Facebook statistics created by tobetracker.net it is also possible to analyze whether a marketing action or social media campaign has positive, negative or none effect on the number of fans in Facebook. This free of charge Facebook page tracking software is usable in several languages, as it was developed as a multilingual tool. Statistics regarding the social network Facebook are displayed in German, English, French, Spanish, Italian and Russian. Another feature of tobetracker is the page comparison that allows you to contrast up to four Facebook pages with each other. It shows the absolute as well as the relative fan growth for periods of one week up to six month. Furthermore, it is possible to easily add Facebook pages, which are not yet in the tobetracker database, in the tab “Add Page”. It’ll only take 2-7 days till you get the first Facebook statistics.